If you're looking for something new under the midcentury sun, Victor Lundy (born 1923) is a real find, an important yet underappreciated figure in the history of American architecture. Trained in both the Beaux Arts and Bauhaus traditions, he built an impressive practice ranging from small-scale residential and commercial buildings to expressive religious buildings and two preeminent institutional works: the US Tax Court Building in Washington, DC (now on the National Register of Historic Places), and the US Embassy in Sri Lanka. This first book on Lundy's life and career documents his early work in the Sarasota School of Architecture, his churches, and his government buildings. In addition to essays on his use of light and material, many of the architect's original drawings, paintings, and sketches—including those from his travels throughout Europe, the Middle East, India, and Mexico, now held at the Library of Congress— are reproduced here for the first time. 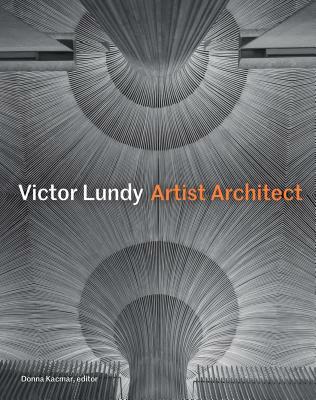 "Princeton Architectural Press takes on the difficult task of publishing the first book about Victor Lundy and does it with remarkable success....[T]his book provides a considered analysis of Lundy¿s life and projects. Victor Lundy Artist Architect is a necessary read to understand the work of an indispensable American architect of modern history." "[O]ne can't think of a better medium to showcase the work of this obscure American midcentury Modernist architect, whose facility with the drafting pencil is the biggest revelation to be found in these pages. Lundy's drawings, both off-the-cuff ideations and measured delineations, are beautiful to behold." "This is not just another architectural coffee-table book. Although all of the images are in black-and-white, there is plenty of visual appeal in the tasteful photographs of Lundy's curvaceous moldings of space. They make a strong case that Lundy was as talented as any "Sarasota School" architect. But the words count, too. Lundy's story is told not in archi-speak, but in a way that brings to life the process of architecture for lay people, as well as professional architects." "This book fills a serious void in the history of Modernism, portraying in handsome images and insightful words accomplishments that too few are aware of..The book's initiator, contributor, and editor Donna Kacmar and its publisher Princeton Architectural Press have turned out a volume that deserves honors for its sheer visual elegance..The works so well documented in this book are inspiring reminders of what can be accomplished within the vocabulary of Modernism."